Optical amplifiers, as the key technology for optical communication networks, have made it possible to transmit many terabits of data over distances from a few hundred kilometers and up to transoceanic distances with wavelength-division multiplexing (WDM) technology, which allows the transmission of multiple channels over the same fiber. The transmission distance of any optical fiber communication system is eventually limited by fiber losses.Optical amplifiers overcome the loss limitation by amplifying the entire WDM signals in strength by several orders of magnitude without requiring conversion of each channel to the electric domain, thus permitting a dramatic increase in capacity of the transmission system and providing the data capacity required for current and future communication networks. The purpose of this passage is to provide an overview of optical amplifiers. A optical amplifier is designed to directly amplify any input optical signal, without transforming it first to an electronic signal. It can amplify all WDM channels together, and is generally transparent to the number of channels, their bit-rate, protocol, and modulation format. So a single optical amplifier can replace all the multiple components required for an electronic regeneration station. What’s more, the transparency of the optical amplifier means that the link can be upgraded without the need to replace the amplifier. Optical amplifiers are extensively applied in the optical communication links. Figure 1 shows three ways in which optical amplifiers can be used to enhance the performance of optical communication links. A booster amplifier is used to increase the optical output of an optical transmitter just before a signal enters an optical fiber. The optical signal is attenuated as it travels in the optical fiber. An inline amplifier is used to restore the optical signal to its original power level. An optical pre-amplifier is used at the end of the optical fiber link in order to increase the sensitivity of an optical receiver. There are three most important types of optical amplifiers used in the optical communication network: the erbium-doped fiber amplifier (EDFA), the semiconductor optical amplifier (SOA), and the fiber Raman amplifier (FRA). Each of these amplifiers is introduced as follows. As the first optical amplifier widely used in optical communications systems, EDFA has resulted in a dramatic growth in transmission capacity with the deployment of WDM systems. EDFAs are very widely deployed and become the basis of the vast majority of optically amplified systems. EDFA is an optical repeater device that is used to boost the intensity of optical signals being carried through a fiber optic communications system. The erbium-doped fiber (EDF) is at the core of EDFA technology, which is a conventional silica fiber doped with erbium. When the erbium is illuminated with light energy at a suitable wavelength (either 980nm or 1480nm), it is motivated to a long-lifetime intermediate state (see Figure 2), then it decays back to the ground state by emitting light within the 1525-1565 nm band. The erbium can be either pumped by 980nm light, in which case it pass through an unstable short lifetime state before rapidly decaying to a quasi-stable state, or by 1480nm light in which case it is directly excited to the quasi-stable state. Once in the quasi-stable state, it decays to the ground state by emitting light in the 1525-1565nm band. This decay process can be stimulated by pre-existing light, thus resulting in amplification. 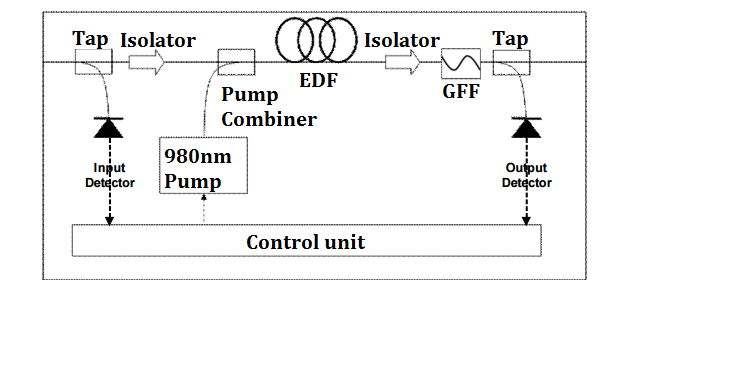 In generally, a EDFA consist of a EDF, a pump laser, and a component (often referred to as a WDM) for combining the signal and pump wavelength so that they can propagate simultaneously through the EDF. In principle EDFAs can be designed such that pump energy propagates in the same direction as the signal (forward pumping), the opposite direction to the signal (backward pumping), or both direction together. The pump energy may either by 980nm pump energy, 1480nm pump energy, or a combination of both. Practically, the most common EDFA configuration is the forward pumping configuration using 980nm pump energy, as shown in Figure 3. SOAs are amplifiers which use a semiconductor to provide the gain medium. A semiconductor optical amplifier is illustrated in Figure 4. The gain medium is the undoped InGaAsP. This material can be tailored to provide optical amplification at wavelength near 1.3 µm or near 1.5 µm, which is the significant wavelength for optical communications. Other semiconductors can be used to amplify optical signals at other wavelengths. The input and output faces of the amplifier are antireflection-coated in order to prevent optical feedback to the gain medium and lasing. SOAs operate in a similar way to standard semiconductor lasers (without optical feedback which causes lasing), and are packaged in small semiconductor “butterfly” packages. Unlike other optical amplifiers, they are pumped electronically and a separate pump laser is not required. SOAs are less expensive and therefore suitable for using in local networks where best performance is not required but cost is an important factor.Despite their small size and potentially low cost due to mass production, SOAs suffer from a number of drawbacks which make them unsuitable for most applications. In particular, they provide relatively low gain, have a low saturated output power and relatively high noise factor (NF). These drawbacks makes SOAs unsuitable for multichannel application but fit for some single channel which don’t require high gain and high output power. A fiber Raman amplifier is shown in Figure 5. The gain medium is undoped fiber. Power is transferred to the optical signal by a nonlinear optical process known as the Raman effect. Power to supply the optical gain is offered by an optical pump. The wavelengths that experience optical gain are decided by the wavelength of the optical pump, so the Raman amplifier can be tailored to amplify a given optical wavelength by proper selection of the pump wavelength. The optical gain in a Raman amplifier is distributed over a long span of optical fiber. Typically, the optical pump is introduced at the end of a length of fiber in order to provide optical gain that increases towards the end of the fiber. In a Raman amplifier, the signal is amplified due to stimulated Raman scattering (SRS). Raman scattering is a process in which light is scattered by molecules from a lower wavelength to a higher wavelength. SRS is a nonlinear interaction between the signal and the pump and can take place within any optical fiber. In most fibers however the efficiency of the SRS process is low, high pump power (typically over 1 W) is required to obtain useful signal gain. Thus, in most cases Raman amplifiers cannot compete effectively with EDFAs. On the other hand, Raman amplification provides two unique advantages over other amplification technologies. The first advantage is that the amplification wavelength band of the Raman amplifier can be tailored by changing the pump wavelengths, and thus amplification can be achieved at wavelengths without being supported by competing technologies. The second, more important, advantage is that amplification can be achieved within the transmission fiber itself, enabling what is known as distributed Raman amplification (DRA). In this process high pump power is launched into the transmission fiber in order to provide amplification for the signal as it travels along the fiber. Since gain occurs along the transmission fiber, DRA prevents the signal from being attenuated to very low powers. Raman amplifiers are often used together with EDFAs to offer ultra-low NF combined amplifiers, which are useful in applications such as long links without inline amplifiers, ultra-long links expanding thousands of kilometers, or very high bit-rate links. Optical amplifiers are the critical technology for the optical communication networks, enabling the transmission of many terabits of data over distances from a few hundred kilometers and up to thousands of kilometers by overcoming the fiber loss limitation. Through concretely introducing optical amplifiers above, I hope this passage can help you get better understanding of optical amplifiers.